<--Skyrail, Cairns Every time I see Dad, he seems older. Is he deteriorating suddenly, or is the picture of him I hold in my mind one of his younger days, strong and feisty and vigorous, so that every time I see him I am struck afresh by how doddery he is becoming? Apart from physically - and he was always a handsome Maltese man, not unlike Elvis, I used to think when I was younger (and so was he) - he seems so much less sharp, cognitively. I find myself repeating myself, several times. He tells me how to get into his safe 'if I'm not around', and where he wants his ashes scattered (off Malta, out to sea - past the breakwater). He hasn't decided what song he wants at his funeral but not Frank Sinatra. He's very healthy, considering he's 70 - he was a labourer from the time he arrived in Australia at 17 until he retired in his early 60s, so he's always been fit. He does Tai Chi and ballroom dancing and has many lady friends, has just finished a tour of Europe with Joan. He's not depressed by any means, just - planning his future I guess. Getting his affairs in order. I love the way Lily Brett describes her Polish Jewish father in 'You Gotta Have Balls' and the one before that (title escapes me). 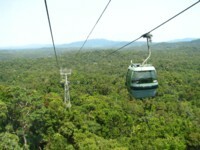 Cairns is hot and gorgeous - green and damp and bustling with tourists. Dad's come to join me, so this training trip is really quite a touristic experience. We met at the airport on Tuesday night - him flying in from Melbourne, and me from Townsville. Yesterday we took the skyrail to Kuranda and the train back - frightfully expensive, and Dad slept all the way back, through 'Australia's most spectacular train journey'. I forgot about the need for an afternoon nap, in my itinerary planning. There's something a bit unsettling about those experiences that are designed specifically for tourists. Vast hordes of us, all following the 'Guide to Cairns' to the letter. Kuranda itself felt odd; a small sleepy mountaintop village, encroaching rainforest on all sides, overrun by tourists, all of us wearing our neon-bright stickers that indicated which combination of skyrail up/train down or vice versa we were on. On one side of the street were bright friendly Aboriginal people playing didgeridu and dancing and stall holders exhorting us to buy corocodile skin purses and mango champagne; on the other side of the street in the unreconstructed pub, old white men in singlets watched the horses on sky TV while the blackfellas played pool. I felt like I was at a zoo. And there's an assumed lack of creativity - the commentary on the train, narrating on points of interest, says, 'And on the left we are approaching Bill's Falls, where the cascades tumble for a hundred metres...You will find the best vantage point for a photgraph is just after we pass the falls, looking back along the train.' A thousand tourists obediently wait until we pass the falls, and all take exactly the same shot of the waterfall. The developmental task of old age is consolidation (sorry I can't remember the theorist - Klein?) - looking back over your life and deciding on the whole you've done a good job. Making sense of it. The alternative, the theory runs, is that elderly people succumb to depression, an overwhelming feeling of pointlessness. I suppose as you prepare to leave this planet, you have to assume that you are leaving it in reasonable condition, otherwise you are leaving your children in the s**t.
The Lily Brett book you're thinking of is 'Too Many Men', and I won't make any jokes about why a lesbian might forget a title like that.